Some time ago a visitor of my website asked me to help him on a special Cisco ASA VPN configuration and thought about sharing it here to help other people as well. Two sites connected with IPSEC Site-to-Site VPN over the Internet. Both sites using Cisco ASA firewalls (version 9.x or 8.4). Site1 is the main headquarters site and Site2 is a remote branch site. The LAN networks on each site communicate between them over the IPSEC VPN tunnel. Hosts in Site1 (network 192.168.1.0/24) can access the Internet via the local Internet connection through ASA1. Hosts in Site2 (network 192.168.2.0/24) can access the Internet ONLY through Site1 via the VPN tunnel. Although there is a local Internet connection on Site2, hosts are not allowed to access the Internet directly. 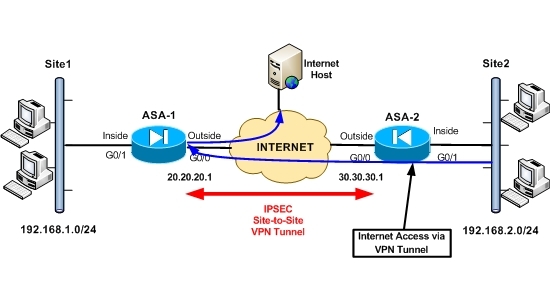 They must come to Site1 (ASA1) over the VPN tunnel and then exit the same ASA1 firewall for accessing the Internet. The situation of having VPN traffic entering and exiting the same ASA interface is called VPN Hairpinning (or “VPN on a stick”). Scenarios like the above are useful in situations where you want to have centralized control of all Internet access (for hosts in the main site and for hosts in remote branch sites as well). You can implement content filtering, caching, virus protection etc on the central main site and have all the other sites use these centralized resources. Since Site2 hosts (private IP addresses) are not allowed to access the Internet locally, you must not configure NAT on ASA2 for translating the private addresses to public. This will prevent them from accessing the Internet. On ASA1, you will have traffic from Site2 entering and exiting the same interface (outside interface of firewall). To implement this you must enable “intra-interface” traffic on ASA1, so that traffic can enter and exit the same interface simultaneously. You can do this using the command “same-security-traffic permit intra-interface”. On ASA1 you must perform PAT on traffic coming from Site2 so that it can access the internet via its outside interface. The ACL used for VPN Interesting Traffic on ASA2 must allow 192.168.2.0 towards “any IP”. This is required so that Site2 can access Internet hosts through the VPN tunnel. The ACL used for VPN Interesting Traffic on ASA1 must allow “any IP” towards 192.168.2.0. This is required so that returning traffic from Internet hosts can flow through the VPN tunnel towards Site2. Let’s now see the configuration on both ASA1 and ASA2. Note: Only relevant configuration is shown. !ACL for VPN Interesting Traffic. We allow Site2 towards any IP. At minimum you need a default route at each site. Thanks for your comment. The config shown is not the whole configuration. There is a Note also on the article above stating that “only relevant configuration is shown” . You are right that you always need a default route (when connected to Internet) which I haven’t included in the above configuration. In any case the example above works since I have tried it. Nice, helped me a lot. However, and here is the kicker. Once I found your site, I still did not get it and spend another 2 hours looking for a working solution. The problem was that I did for some reason not see the (outside,outside) on the PAT for the outside interface, but instead was so used to use (inside,outside) there that I used that. And that of course was not working. Otherwise great article and as I said, worked for me just fine. Dominik I’m glad my article helped you, thanks for the feedback. Your website is a gift to those that know about it. I am very glad to have stumbled upon it and it has been very helpful to me. Your method of breaking down configurations are so good. You are amazing and I will make sure I buy you books to help me more in my pursuit of CCNP security which I just started recently. With your great tutorials I am making progress. Thanks alot and may God bless you. Thank you so much for your nice words. This gives me more strength to continue offering my knowledge to the networking community. Is this configuration include in any of your books. If so, which book is that because i’m interested in buying that book. Thanks. Just want to thank you for this clean and straightforward configuration. Just tested on my GNS lab and go straight into production for a very critical task in the next week. My family will thank you for time and headache saved! I’m glad my configuration has helped you. Have a great day.